TEHRAN (Tasnim) – Iranian President Hassan Rouhani praised his Afghan counterpart for announcing a temporary ceasefire in the war on armed militants in the holy month of Ramadan. 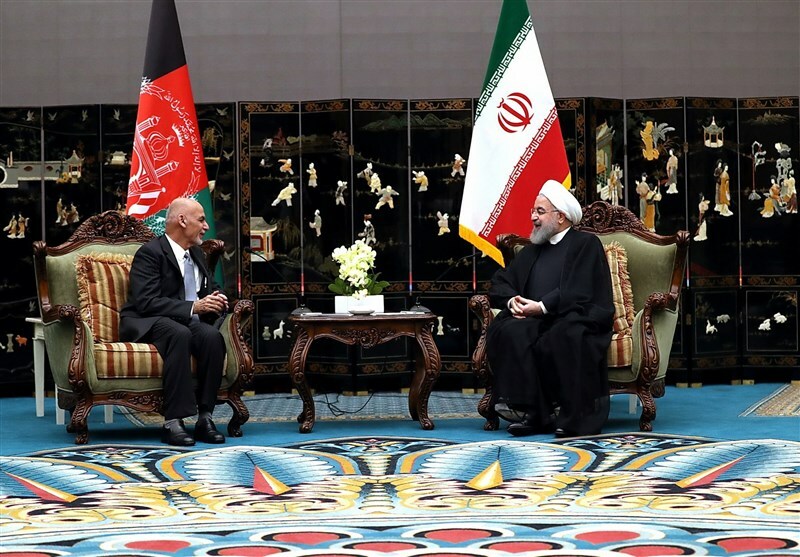 In a meeting with his Afghan counterpart in China on Saturday, President Rouhani hailed Ashraf Ghani’s initiative for ceasefire, expressing the hope that internal dialogue in Afghanistan would result in stability and development. The meeting, held on the sidelines of the Shanghai Cooperation Organization summit in the city of Qingdao, came two days after the Afghan president ordered the security forces to cease operations against the Taliban until June 20, coinciding with the end of the holy month of Ramadan. He further stressed the need for mutual cooperation against the production and smuggling of narcotics. Hoping for an immediate finalization of a comprehensive cooperation deal between Iran and Afghanistan, Rouhani said Iran is resolved to boost ties with its eastern neighbor and make investment in various development plans in Afghanistan, such as in the transportation infrastructures. Highlighting the significance of a transnational project on development of Iran’s southeastern port city of Chabahar in cooperation with India and Afghanistan, the president said the major project will contribute to stronger transit routes in the region. President Ghani, for his part, called for the accelerated growth of economic ties between the two neighbors, saying development of Chabahar port will benefit not only Iran, Afghanistan and India, but also would enhance trade between China and Central Asia. He also pointed to the Taliban’s approval to his ceasefire initiative on the occasion of Eid al-Fitr, noting that the Daesh (ISIL) terrorist group is excluded from the plan and would face the Afghan forces’ harsh, continued operations. In a televised address on Thursday, Ghani had announced that fighting against armed groups other than the Taliban, such as Daesh, will continue. “This ceasefire is an opportunity for Taliban to introspect that their violent campaign is not winning them hearts and minds but further alienating… With the ceasefire announcement, we epitomize the strength of the Afghan government and the will of the people for a peaceful resolution to the Afghan conflict,” Ghani had announced. Ghani had in February offered recognition of the Taliban as a legitimate political group in a proposed political process that he said could lead to talks to end more than 16 years of war. It is an affair of people of Afghanistan- don’t mix your Iranian affairs in this mess.